This Sicily travel guide tells you how to get the most out of your holiday in Sicily: the best hotels and restaurants, the most interesting places to see, and the culinary highlights of Sicilian food. 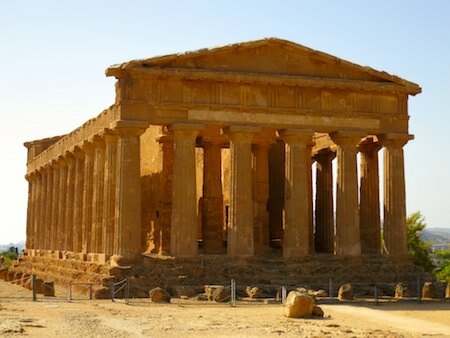 Sicily has been inhabited since ancient times. The island’s position in the Mediterranean, the richness of its volcanic soil (thanks to Mount Etna, which is still erupts frequently) and its sheltered harbours attracted the Phoenicians, the Greeks, the Romans and the Ottoman Turks. Later, it attracted Norman knights, the French kings and the Spanish Crown. 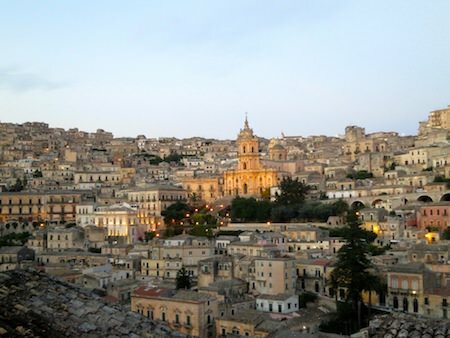 During the Baroque era, when the local nobility erected churches and palaces of astounding beauty in the towns of Noto, Modica and Ragusa, Sicily was ruled by the Spanish monarchy. This long, rich history accounts for the magnificence of its churches, palaces and fortresses. The best time of the year to go to Sicily is early fall (September) or spring (May and June). September is best for people who love to swim in the sea. The water is warm and inviting. Never go in late July and August when Italians take their annual holiday. That is when hotels charge the highest prices and the beaches are overcrowded. Most people fly to Palermo or Catania airports which are served by traditional carriers and budget airlines. You can take an overnight ferry from Naples, but it’s cheaper and faster to fly. You can also take the train from Rome or Naples (again the train is more expensive than air travel), but be prepared for a long railway journey. There is still no bridge between the mainland and Sicily, and if cynical Italians are to be believed, there will never be one, even though the crossing is very narrow. What happens is the train arrives at the “toe” of the Italian boot, Reggio di Calabria, and the Italian railway workers put the rail cars on a ferry and, 25 minutes later, unload them at Messina in Sicily for the trip to Palermo. Catania is a more convenient place to fly in and out of than Palermo, if you plan to stay mostly in Taormina and the eastern/southeastern part of Sicily. Rent a car and explore Palermo for one to two days. Although most of the preserved Greek temples are in Western Sicily (Agrigento and Segesta), that part of the island has fewer hotels and amenities for travelers (you can read our guide to Western Sicily and Erice). A word about driving in Sicily: If you want to explore the island, you will have to rent a car. Roads are in good condition, thanks to money from the European Union. Driving is easy and stress-free around the island, except in Palermo where signage is virtually non-existent, street markings are a rarity and traffic is a nightmare. Drivers give each other about 3 centimetres of space on either side. There is only one rule in Palermo: don’t hit anyone or anything. If you drive in Palermo and survive unscathed, you will be proud of yourself and feel much more confident to drive anywhere in the world (except perhaps in India). Taormina is the most visited town in Sicily. Since the days of the Grand Tour and for almost two hundred years, famous people such as Goethe, Alexandre Dumas, Johannes Brahms, Cary Grant and Woody Allen have stayed in Taormina. When you arrive in Taormina, you will understand why. Built on high cliffs overlooking the Mediterranean, the town has lovely squares surrounded by cafes and restaurants, splendid palaces (which have been converted into luxury hotels) and an impeccably restored Greek Theatre that is still used for performances. The main thoroughfare of Taormina is closed to automobile traffic so you can stroll leisurely past designer boutiques and gelato bars, and wind your way to the large square that overlooks the sea, where locals and visitors spend the better part of an afternoon. It’s not just the views over the sea that attract visitors to Taormina, it’s the atmosphere to the place. There are many hotels in the town and just outside it for all budgets. My favourite is the Ashbee Hotel: an early 1900s villa converted into a luxury boutique hotel with stunning views over the sea and the coastline, a quiet private location, onsite parking, swimming pool, breakfast and dinner on a lovely garden overlooking the Mediterranean. I stayed at the Ashbee and would stay there again. Grand Hotel Timeo: the first hotel to be built in Taormina, this luxury hotel overlooks the sea and is close to the Greek Theatre. Hotel Villa Ducale: luxury boutique hotel with only 11 rooms and 6 suites, breathtaking views over the Mediterranean, spacious outdoor terraces. Hotel Imperiale: renovated in 2009, this contemporary luxury hotel has a large swimming pool and spa, views over the sea, and private balconies. Shalai Resort near Mount Etna: Not in Taormina but close by is this wonderful hotel in a restored 19th century mansion. Perfect for exploring the area around Mount Etna. Like any popular tourist destination, Taormina has restaurants that serve authentic Sicilian cuisine and others that cater to tourists’ perverted notions about Sicilian cuisine. There are three restaurants I recommend, which serve local specialties such as spaghetti with sea urchin and pasta with tuna and mint. La Tavernetta: via Timoleone 22 (hidden on a series of steps). La Botte: Piazza Santa Domenica, 4 (tucked away on a tiny square opposite a small church). Il Giardino degli Ulivi: Located in the garden of the Grand Hotel San Pietro, this chic restaurant has great views over the sea and serves Sicilian food with a modern twist. All restaurants have outdoor seating and serve lunch and dinner. You will need at least 2 days to explore Noto, Modica and Ragusa, a cluster of towns known for their baroque churches and palaces. The towns were destroyed by a powerful earthquake in 1693 and reconstructed in the Baroque style. These Baroque churches and palaces were restored recently with money from the European Union. My advice is to stay in Noto at the atmospheric Seven Rooms Villadorata, an opulent guesthouse of seven large suites in a renovated palazzo in the center of Noto and to use Noto as a base to explore Ragusa and Modica. Villa Carlotta (Ragusa): Former aristocratic estate turned into a modern boutique hotel just outside Ragusa. One of the highlights of this hotel is its excellent La Fenice restaurant which balances traditional Sicilian cuisine with contemporary interpretations of local specialties. It is also known for its wine cellar of more than 900 bottles. Eremo della Giubiliana (Ragusa): Luxury resort-hotel in a restored former convent, a few kilometres south of Ragusa. Ristorante Il Cantuccio (via Cavour 12, Noto): This intimate restaurant is just down the street from Seven Rooms Villadorata and serves local specialties. It is reasonably priced and has a good selection of Sicilian wines. I ate here twice and thoroughly enjoyed the food and the excellent service. Fattoria delle Torri (Vico Napolitano 14, Modica): Serving creative dishes that are a modern take on Sicilian cuisine, this elegant restaurant is a bit difficult to find but well worth it. Extensive wine list, more expensive than Il Cantuccio in Noto; a great find in Modica. Duomo (via Capitano Boccheri 31): Located in the heart of Ragusa, this elegant restaurant features local cuisine cooked to perfection with meat and fish dishes to please every palate. Siracusa (Syracuse) and the tiny island of Ortigia that is connected to it via bridges, are among the oldest settlements in Sicily. Founded 2700 years ago by Greek Corinthians, Siracusa is also the birthplace of Archimedes. You can explore Ortigia in a day or stay there overnight if you want to have more time to walk around the narrow atmospheric streets of its ancient quarters. You can stay in Ortigia itself or very close to it (5 minute walk to Ortigia) in Siracusa. There is hardly any parking in Ortigia; you’ll have to park just outside by the harbour. Hotel Cavalieri: Just across Ortigia by the harbour, a modern boutique hotel, reasonably priced, with parking options. Algila Ortigia Charme Hotel: Located in Ortigia, this recently renovated historic hotel boasts one of Ortigia’s most important ancient sites in its basement — a 6th century mikva (Jewish ritual bath). Oinos Restaurant (via della Guidecca, Siracusa): Located in the ancient Jewish quarter of Ortigia, they serve delicious fish dishes such as seafood cuscusu and pasta con le sarde. Regina Lucia (Piazza Duomo 6, Ortigia): Located on one of the most beautiful piazzas in Sicily, this restaurant specializes in local cuisine with an emphasis on seafood. Please refer to Mapplr’s dedicated travel guide to Western Sicily (and Erice) with recommended hotels and places to visit. Capuchin Catacombs of Palermo: Macabre and creepy, this underground cellar of dim passageways lined with dead people’s skeletons (still wearing their robes), preserved by the Capuchin monks over the centuries, is one of the most memorable places you will ever see. Not a good idea to go alone simply because by the time you come to the end of the first corridor, the hair on your neck and arms will be standing straight up. The preserved 2-year old girl (who died in 1920 and has the honour of being the last person embalmed by the monks) in a glass-covered cradle is morbidly fascinating because she seems to be in the bloom of life with her chubby red cheeks and curly locks. Cappella Palatina: Royal chapel of the Norman kings of Sicily located on the second floor of the Palazzo Reale built in 1080 distinguished by its Byzantine architecture and dazzling golden mosaics. 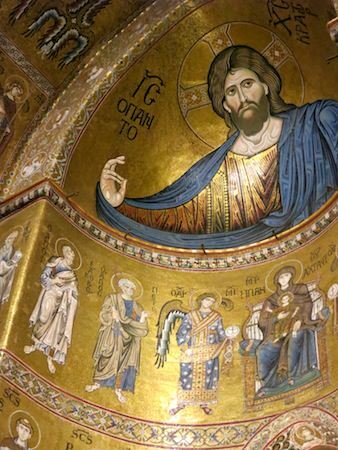 Monreale: A small town just outside Palermo, its main attraction is the Cathedral of Monreale constructed between 1174 and 1182 by William II and is considered one of the finest examples of Norman architecture in the world. Like the Cappella Palatina, the cathedral’s ceiling and upper walls are decorated with impressive Byzantine mosaics. Viucciria: This market has been providing fresh fish, vegetables and fruit to Palermo residents for 700 years. Check out the astounding variety of fresh fish. 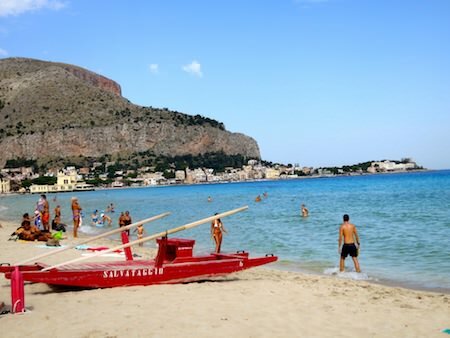 *Tip for a sunny afternoon: Head to Mondello just outside Palermo along the coast. Mondello’s white sand beaches and warm waters are the perfect place to spend an afternoon. Have lunch at one of Mondello’s beachside trattorias. There is an excellent restaurant in Mondello called Bye Bye Blues on via del Garofalo 23. There isn’t one hotel in Palermo that I’m crazy about and would wholeheartedly recommend. The two hotels listed below are the best of the lot. Grand Hotel Villa Igeia: Located on the waterfront, this hotel has large rooms, swimming pool, gardens, outdoor dining. You need to take a taxi to the center of Palermo to see the main sights. Hotel Porta Felice: Modern boutique hotel near the port, less expensive than Villa Igeia, need to take taxi to main sights. You can stay outside Palermo at the vineyard resort of Agrirelais Baglio di Pianetto in Santa Cristina Gela (20 km from Palermo). Osteria dei Vespri (Piazza Croce dei Vespri 6): Located on a hidden square where Visconti filmed the principal part of “The Leopard” (Il Gattopardo), this restaurant serves modern Sicilian cuisine. The food is marvelous and the atmosphere is memorable because you dine under the stars in one of the oldest quarters of Palermo. Reservations are absolutely necessary because it’s a small place. Ask for a table outside if the weather is good. Gigi Mangia (Via Principe di Belmonte 104): fresh seafood and pasta, local dishes and desserts. This is not the time to go on a diet, nor is it the time to be squeamish. Sicily is all about the seafood and fresh vegetables, many of which you don’t find outside Sicily. (1) Pasta with small sweet red shrimp: If you find this on the menu, eat it. The shrimp has an intense red colour and is very sweet. It is a type of deep water shrimp called aristaeomorpha foliacea which breeds in the summer off the coast of Western Sicily and lives in deep waters (200 metres and more). This is the best shrimp I have ever tasted. (2) Cuscusu: Seafood couscous is found mostly in Western Sicily, but is served in seafood restaurants around the island. (3) Pasta with tuna and mint: Unusual combination of flavours that work well. (4) Pasta with sea urchin: Like pasta with tuna and mint, sea urchin and pasta are a divine combination. The sea urchin gives the pasta a slightly unctuous texture. (5) Pasta alla norma (with eggplant): This dish originated in Catania and is composed of penne, eggplant, tomatoes, ricotta salata and basil. You can find this in many restaurants across Italy, but it is best made in Sicily. (6) Pasta con le sarde: Bucatini with sardines, pine nuts, raisins, saffron, anchovies, wild fennel and breadcrumbs. This is the quintessential Sicilian dish and if you want to make it, follow the recipe of Giorgio Locatelli. (7) Fava beans and peas pureed together, and served with ricotta, toasted breadcrumbs, and herbs such as mint. (8) Polpette di pesce spada: fried ground swordfish balls served in a piquant tomato sauce. (9) Involtini di pesce spada: thinly sliced swordfish fillets, stuffed, rolled and baked. (10) Tenerumi in soup: Tenerumi are the vine tendrils of the cucuzza (pale, long courgettes) and they are most often used in brodetto (soup) in the summer. That was a great and informative! I think this would help plan a trip to Sicily as you have shared everything including the best hotels and menus which are the important factors that every traveler would look into. i would pass this on. Awesome!